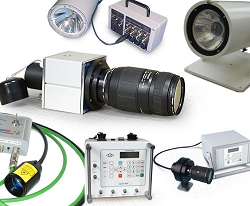 A RANGE of accessories from Specialised Imaging are designed to optimise the performance of high-speed imaging cameras used in industrial, defence and scientific applications. High-speed cameras generally employ optical triggers to ensure data collection is synchronised to a transient process. The OT3 optical trigger is battery-driven for portability, and to isolate its operation from interference such as ground loops, noise spiking, or brownout. The sensor is a blue-enhanced array of twelve diodes with a spectral response from 300 to 1300nm. A 700nm cut-off filter reduces the range from 300 to 700nm, so it is less likely to saturate from high IR sources such as clouds. The OT3 it can be used as an IR flash or a sky-screen detector, and the sky-screen reference can be artificial (a white board or an LED array), removing operational dependence on weather. Specialised Imaging says this trigger offers particular benefits with ultra-high speed cameras on proofing ranges. These cameras require very short exposure times to capture events with a duration of only a few nanoseconds, requiring the use of short-duration high-intensity illumination sources. The company offers two high-power xenon flash units, providing concentrated high-intensity beams, for this purpose. Among its very high intensity flash sources is the AD500 is a short-duration flash. This is suitable for scientific and industrial processes occurring over short periods, abd can be precisely synchronised to match the time frame of an event being recorded. The flash tubes use xenon, which produces a spectral output at virtually all wavelengths of the visible spectrum, making it suitable for both film and solid-state sensors. With lifetimes of thousands of hours, they rarely need replacing, and the low power consumption means they are inexpensive to operate and produce little heat. Specialised Imaging also offers supports to provide a stable platform for high speed cameras. The QST-PHD camera tripod and TP HD2 pedestal stand both use a rack and pinion driven centre column to enable vertical height adjustments of up to 46cm.